Over the many years I have been researching my ancestry, I have met others with similar interests. Some have become online friends with whom I correspond and with whom I exchange information. Others I have lost contact with over the years. I recently reconnected with a fellow researcher of family from Trentino – Allen Rizzi. Allen’s roots in Trentino are the villages of Tret, Cloz, and Fondo, all of which are in Trentino’s Val di Non (Non Valley), as are my roots. Allen though, took his research and heritage one step further — he moved to Tret, and has lived there many years. With a writing background, Allen authored a few books — one of which “Our First Year – Sketches of an Alpine Village” is a must-read for those of us interested in learning more about our heritage and the way our ancestors lived in Val di Non. Allen tells of his move to Tret, meeting the young and elderly residents in this village of less than 300 souls, and the languages and customs he found. Tidbits include: notes about buildings still standing after 400 years, gravestones with photographs of the deceased, a 91-year-old woman who still negotiates ancient steps each day to walk about the village, the quirks of on-again/off-again utilities, and of course the wonderful homemade grappa! As of right now, Allen’s book is available only in a digital ebook version at Amazon. Allen also provides research and translation services. Please note that I do NOT have any financial or other ties to Allen’s book or his services. As I mentioned above, I have made many contacts over the years. Many have been online friends for over a decade. The benefit of making these contacts is that I have been able to help some of them in their research, and received assistance from others in mine. This exchange of information has not only provided very useful leads and links to others, but also leads, documents, and photographs for me. In some instances I have led others to discovering a “missing link” or information they never had. Years later, some remembered me and the information I was looking for, and surprised me with some very useful information or documentation. Don’t be shy about helping others in their research — the old saying “what goes around, comes around” is true. 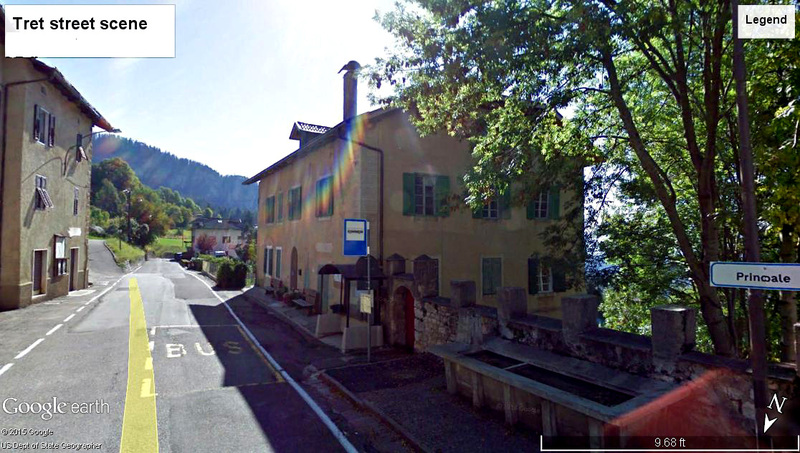 This entry was posted in Culture, History, Towns and Villages and tagged Fondo, Trentino, Tret, Val di Non. Bookmark the permalink. Hi my name is Theresa Zeigler and my parents were born in Rallo, in the Val di Non, Trento, Italy. My Mama’s name was Carlotta Valentini, and my Papas name Carlo Pinamonti. We still have cousins living there and in Tassullo, Trento, and Tuscany. I’ve enjoyed reading Sal Romano’s site for many years. He is a valuable source of information. We are blessed to have this wonder website to help us with every aspect of our ancestors in Austria/Italy. Thanks Sal. If you have family from the Val di Non, please let us hear from you! My name is Jack Recla and I am looking for my Great Grand Father born in Ronzone, Italy approximately 1855-1860. Vicenzo had two sons named Lorenzo Vincenzo Recla , born May 18, 1886, Gaspare Giuseppe Recla born October 3, 1889 and a daughter Virginia Antonietta Recla born February 20, 1888. Vicenzo was married to Rosa Rizza. I cannot find any other information about Vicenzo though. Can you help? Thanks Sal for another great post! I had lunch in Tret on my last visit to the Val di Non in September 2014 along with a friend from Castelfondo, Andrea Cologna, and another, Marco Romano, of Fondo. “Le Ciaspole” was a wonderful, cozy restaurant just outside the village of Tret. I have downloaded Allen’s book and am eager to read it. On the next visit to my ancestral home of Castelfondo, I will try to meet up with Allen. It would be fun to compare our genealogy research and see if there are any connections between our families. Many of the names you mention are very familiar: We have been friends with Marco Romano and Antonella and Ivano of the Ciaspole for many years. I have done much research on the Genetti family and have lots of information to share if you would like. Also, we have many Genetti friends in the valley, including Marco Genetti in Fondo. The next trip over, please look us up. We are right up the hill from the Ciaspole.